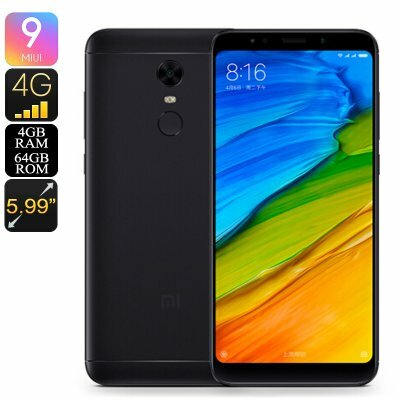 Successfully Added Xiaomi Redmi 5 Plus Smartphone - Android 7.1, 4GB RAM, Snapdragon 625 CPU, 64GB Memory, 4G, Fingerprint Scanner, 4000mAh to your Shopping Cart. 4000mAh battery ensures you can go all day without having to recharge. The Xiaomi Redmi 5 Plus is one of the best mid-range phones. With a Snapdragon 625 octa-core CPU and 4GB RAM, it brings a commanding performance. The phone also sports a large 5.99-inch screen with the popular 18:9 aspect ratio the is all the rage these days. The screen brings FHD+ resolutions of 2180x1080 which works out at a 403PPI. All this means that movies and games will look their best on the Xiaomi Redmi 5 Plus. The minimal bezels and smooth matt finish are fairly attractive and the Redmi 5 Plus has the same layout as previous Redmi phones with the central rear camera and fingerprint scanner beneath. This stellar budget phone comes with the Android 7.1 OS which has the MIUI 9 skin. This brings a few little extra tweaks that enhance the OS interface. With regards to connectivity, the Redmi 5 Plus supports a slew of network frequencies including 10 4G bands. Added to that the dual SIM setup and this phone makes a great travel companion. You will also be able to benefit from the dual-band Wi-Fi letting you download and stream data at faster speeds. If all this wasn't enough to convince you then take a look at the 4000mAh battery that brings up to 10 hours of continuous talk time. This product comes with 12 months warranty, brought to you by the leader in electronic devices as well as wholesale cool gadgets.